In 1954, post-war America was roaring into the boom years. More families than ever before were able to afford family cars. It was a bold decade filled with bold vehicles, chrome-decorated luxury machines that reflected all the optimism and progress of the ‘50s. Suddenly, everything was shiny! More cars meant more need for quality, trustworthy, affordable car service. So along came Chapel Hill Tire— and we were glad to oblige. The world, and its cars, may have moved on in the 60 years since our inception, but we’ve continued to provide the same stellar service throughout the years. As cars changed — and boy, did they change! — our expertise kept up. Let’s take an automobile retrospective, starting in the glory days of Detroit and moving right on up through Chapel Hill Tire’s fleet of hybrid future machines. A rising middle class wanted nicer vehicles, and the car industry obliged. Turn signals, for instance, changed from a luxury add-on to factory model standard, and the independent suspension became common. However, safety wasn’t yet a huge concern: cars didn’t even have seatbelts! 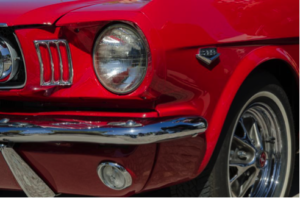 The same decade that brought the world a counter-cultural revolution also introduced the cars that would become the icon of all things America: the Ford Mustang. 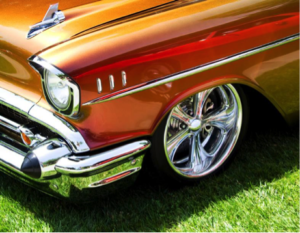 You can see that chrome was still important, but car designs got sleeker — the ‘60s introduced the concept of the compact car, an important part of the design of this decade’s infamous muscle cars. As car sales skyrocketed through the ‘50s and ‘60s, so did car-related deaths. The industry tried to aggressively address the problem by the 1970s, introducing four-way anti-skid systems (you know them as anti-lock brakes) and airbags (although these didn’t become standard until the Porsche 944 of 1987). 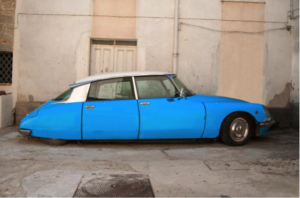 As fuel prices rose, aerodynamic designs became more important, and cars began to look straight out of the space age! But innovative as they were, the ‘70s were nearly the death of American automobile manufacturing. The “Big Three” American automakers — General Motors, Ford, and Chrysler — began to be crowded out of their own market by cheaper, more fuel-efficient imported cars, particularly the Japanese. It was the age of the Toyota, and its influence hasn’t left us yet. The era of strange hair also brought with it a strange car: the DeLorean DMC-12, made famous in Michael J. Fox’s Back to the Future. 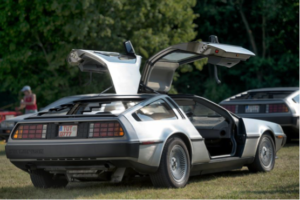 It sported stainless steel panels and wings for doors, and it perhaps personified that strange decade better than any other vehicle around. Car engines also got a reboot as electronic fuel injectors replaced carburetors, in part to comply with federal emissions standards. Two words: electric cars. Although designs for electric cars have been around for a century, the Clean Air Act of 1990 spurred car manufacturers to develop cleaner, more fuel-efficient cars. 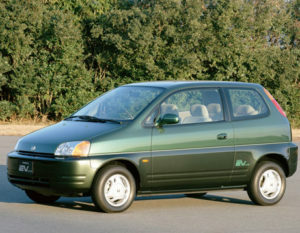 However, these cars were still cost-prohibitive, and they tended to have limited range. We needed better solutions. Enter the hybrid. As the whole world began to become aware of environmental issues, hybrid cars — cars with both electric and gasoline engines — burst onto the scene. 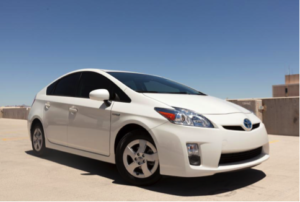 Their popularity began with the Toyota Prius, the first hybrid four-door sedan released in the U.S. market. The future really was here. At Chapel Hill Tire, we were early adopters of hybrid technology. We were the Triangle’s first certified independent hybrid service center, and we have an entire fleet of hybrid shuttles for your convenience. And, more importantly than that — we just plain love cars. Make an appointment online and see for yourself what half a century’s experience can do for you!